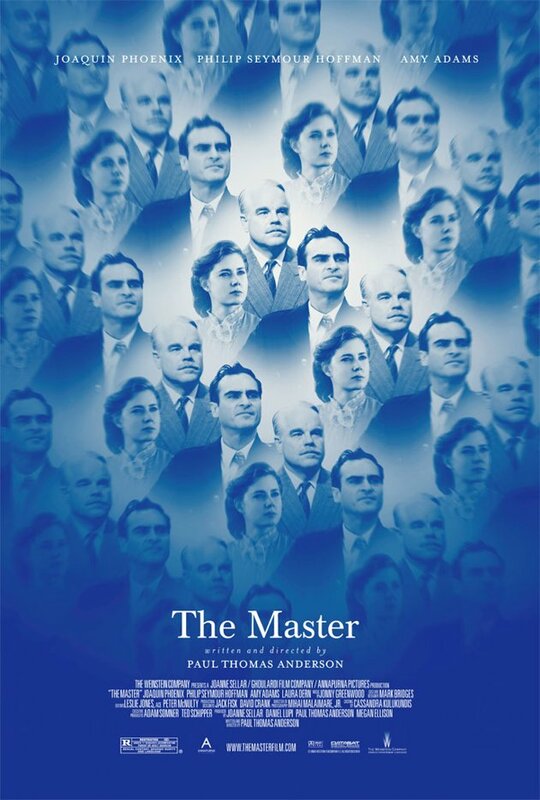 “The Master” begins in much the same way as “There Will Be Blood” (2007), Paul Thomas Anderson’s previous film. We are painstakingly introduced to a man, alone, at length, before any of the other main players get their hands on him. Here the man is Freddie Quell (Joaquin Phoenix), a seaman who we meet at the tail end of the Second World War. There is no fighting. We see him carousing on a beach during downtime and drinking rocket fuel as the end of the war is announced. We follow him back to civilian life, as he drifts from job to job, continuing to concoct drinks from various chemicals and toxins, leaving a trail of alienation and injury. He is screened or treated for what we would now call post-traumatic stress disorder. Whether the war has shaped him in any way is hard to say; he is delivered to us as-is. Finally, having poisoned a fellow farmhand with the latest of his invented intoxicants, he stows away on a ship full of wealthy revelers. Lancaster Dodd (Philip Seymour Hoffman) is in charge, and finally, having built Quell, Anderson can start to use him. Dodd introduces himself the morning after their offscreen meeting: apparently Quell had been belligerently drunk and offered himself as an able-bodied seaman in need of work; Dodd had discovered a flask of Quell’s homebrew and finished it up. Dodd, we piece together, is the aggrandizing, speechifying inventor of the Cause, a cult-like hodgepodge of self-help and mythos. Quell will become part of his broad entourage as they travel America drumming up support and enjoying the patronage of various adherents. For the rest of the film, then, we will see what Quell can do to this other man, and what can be done to him. A wonderful key scene establishes the relationship between the two men. On the ship, Dodd offers Quell some “informal processing”, in which he will demand Quell’s concentration and pepper him with insistent questions about his past and his feelings. We learn, among other things, that years earlier a twentysomething Quell had abandoned his sixteen-year-old sweetheart Doris (Madisen Beaty) to go off so sea. Dodd bookends this hypnotic questioning by sharing long draughts of Quell’s brew. In this way each man is armed. Quell’s booze is cobbled together from whatever he can get his hands on—fuel, darkroom chemicals, paint thinner. It is poison. We know that this poison can be dangerous—the farmhand of the opening—but it doesn’t hurt Quell and it doesn’t hurt Dodd. Instead Dodd relishes it, is fascinated by it. Dodd’s Cause seems much the same. He is accused at various moments of making it all up as he goes along, cobbling together mysticism and pseudoscience into a blend that is not oppressive but exploitative. The hope, optimism and yearning of the various adherents and patrons we meet is attracted to Dodd’s product. Perhaps it harms them as Quell’s drinks would. But Quell is immune to it. Yet while each has a tool that is frustrated by the other, these two men are not equals. Quell, who seems to exist wholly in the past and the present, uninterested in conceiving of any future at all, can be diverted by the Cause, show an almost feline curiosity in the strange rituals Dodd puts him through, but he cannot be consumed or contained by it. He is a passenger. Dodd, by contrast, orients to the future. What is his next move? What will he have his people do next? What will he write? He snaps at an erstwhile patron at the launch of a new chapter in the lore of the Cause, seeming to feel the pressure of being backed into the corner of his own construction. The allure of Quell and his elixir is to be viscerally present, to be the kind of animalistic spirit that Dodd’s Cause seeks to suppress. Why, at the heart of it all, do Quell and Dodd stay together? For Quell, maybe it is as simple as him having nowhere pressing to be. He endures plenty of humiliation and punishment with relative ease. Dodd, again possibly inventing on the fly, has Quell walk the length a room for hours on end; he has Quell endure, without reacting, taunts from Dodd’s son-in-law. These seem cathartic for Quell, but never does he change. Dodd disapproves of all of his attempts to “help” the Cause—again and again Quell visits violence on those who dare to be openly skeptical or obstructive to the Cause, and again and again Dodd scolds him, yet keeps him around. He again seems to be exactly the animal that Dodd rails against but seems fascinated by. Perhaps this is why Peggy (Amy Adams), Dodd’s wife (seemingly the latest in a line) and the film’s maternal presence, is so wary of Quell. His approach to life is not just antagonistic to the Cause, but potentially damaging to her husband, and she seems fully committed to both in a way that Dodd himself is not. She demands that Dodd promise to drink no more of Quell’s hooch, no more of the corrosive stuff. She surely perceives what it is capable of: it renders Dodd under Quell’s power as others are under Dodd’s. By the end it seems to me that in this meeting of two opposing forces it is Dodd who is broken. Dodd, his daughter and son-in-law, and Quell travel into the desert with a motorcycle. Dodd invents a “game”: pick a point and drive to it as fast as you can. He goes first, speeding off, speeding back. Quell goes next. He doesn’t come back. What point did he pick? He is gone. He goes back to the home of Doris, the girl he left behind years before, but she is gone, married with children now. Later, Dodd tracks Quell down (or Quell dreams that he does) and asks him to come to England, where he has established a school. Quell had ridden free, yet he goes. Why? On his arrival, he is berated by Peggy and scolded by Dodd: how dare he have abandoned them? If he stays, he must commit to the Cause. If he leaves again, Dodd warns, he cannot come back. But Quell cannot be tamed this way. Dodd is powerless. Whether or not it was because of his relationship with Dodd, Quell has finally addressed something other than the present. “There Will Be Blood”, Paul Thomas Anderson’s previous film, in retrospect had a relatively straightforward title. Here there are plenty of candidates for the title of Master. Quell or Dodd? The booze or the Cause? Who is in charge of whom?